The Holiday Season Is Upon Us!! If you’re like me, you’re saying to yourself, “Where did the time go, November is already almost half over?”. I say it all the time now, but man time sure flies! I can’t believe the holidays are just around the corner! 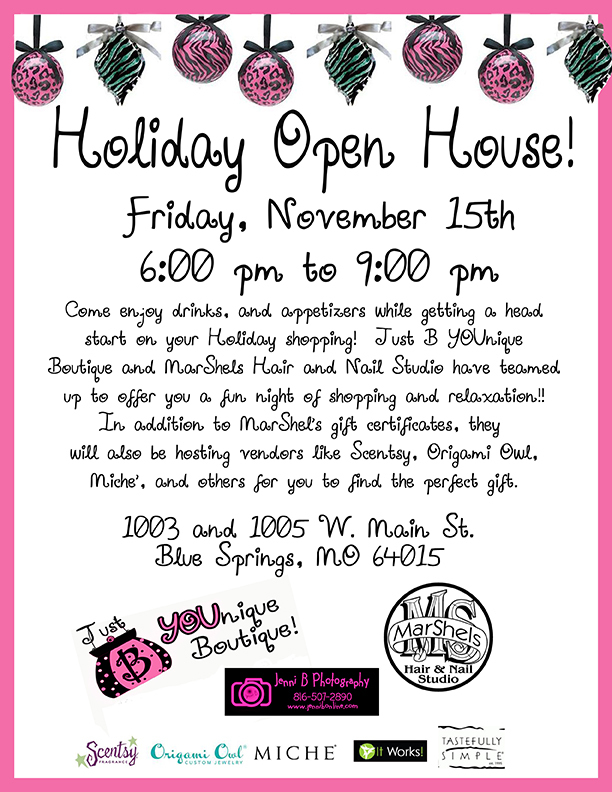 While I’m still working on being a better blogger…I did want to post a quick note to let you know about our B YOunique Boutique and Jenni B Photography Holiday Open House this Friday night!!! We’ve teamed up with the gals next door at MarShel’s Hair and Nail Studio and it is going to be F.U.N.!! So come out and see us this Friday! There’ll be lots of new fall merchandise in the boutique and some awesome Jenni B Photography deals!! Not to mention cocktails and snacks!!!!! !